Poster Abstract Submissions – for presentation during the American Massage Therapy Association (AMTA) Convention. Students and practitioners may apply. Scholarships – The Foundation no longer offers scholarships. However, the American Massage Therapy Association (AMTA) does offer a scholarship for students. For more information click here. Practitioner Opportunities – Submit a case report to our journal, the International Journal of Therapeutic Massage and Bodywork (www.ijtmb.org) for review. Your work may qualify for the opportunity to be published. 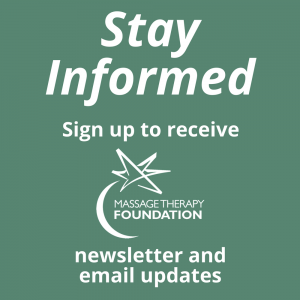 Gini Ohlson, Executive Director at gohlson@massagetherapyfoundation.org / 847-905-1520 for more information.